EDF created Climate Corps in 2008 as an innovative solution to help business overcome the barriers to sustainability. 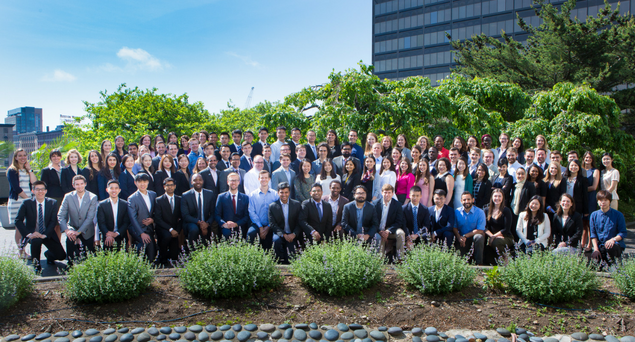 Since the program’s inception, we’ve recruited hundreds of highly-skilled, top graduate students and placed them within leading organizations to provide hands-on-help in achieving their corporate energy goals. In just one summer, our fellows gain unparalleled professional experience, while helping organizations realize deeper energy and cost savings. 7 fellows worked on projects in 3 different states. 27 fellows worked on projects in 7 different states. 57 fellows worked on projects in 16 different states. 96 fellows worked on projects in 23 different states. 97 fellows worked on projects in 27 different states. 116 fellows worked on projects in 28 different states. 117 fellows worked on projects in 28 different states. EDF Climate Corps expands internationally by placing 6 fellows in China. 117 fellows worked on projects in 22 different states and 7 fellows were embedded in China-based organizations. 125 fellows are deployed, 9 of which are recruited directly from Chinese universities and placed in multinational companies in China. EDF Climate Corps releases its first ever trend report, Scaling Success. 108 fellows were placed with 93 companies and 12 fellows were embedded in China-based organizations. 114 fellows were placed with 97 companies and 22 fellows were embedded in multinational and Chinese-owned organizations in China.